Lots of Preposition Examples below here. Are you want to learn Preposition? Are you want to know the use of preposition? If yes, then this blog is the right place for you. There are lots of various preposition examples here. It helps to learn all about preposition. Prepositions are very important for a sentence. So if you better in English grammar, then you should learn preposition must. Here we post lots of preposition examples. 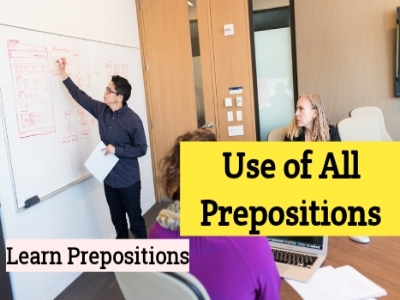 Today we discuss the use of all prepositions with preposition examples. Before the read this post you must read this article about the definition, kinds of preposition here. There is a cloud in the Sky. Girls are playing football in the street. She is sitting in the Sun. They went out in the rain. Nature wears flowery in Spring. He will be living for Mumbai in an hour. I finished my work in three hours. I shall do it in March. The boy went out in the sun. He is in a bad Temper. I am in straitened Circumstances. He is in rice business. He is in practice of Medicine. He found a true friend in her. He came here on Tuesday last. On 1 st January 2018. He came here on Monday last. On the death of his parents. Dr. Sen spoke on Shakespeare's sonnets. He will speak on social- welfare. The thief drew a knife on the stranger. The students marched on Writer's Building. My house is on the main road. The story is not based on facts. He acts on his father's advise. He was arrested on a charge of theft. I live on pension my wife's salary. I play a song on my Guitar. He spoke to me on the telephone. The man was appointed on these terms. I am appointed on no condition. We went for a picnic on a sunny day in January. The School remains closed on 1 st January. Note: In U.S English, 'On' is omitted in indicating the time. I can stand on one foot. He wore a golden ring on middle finger. There is a coat on the hanger. He got on a running bus/ train. People travel on the Bus/ train. I reached the Station at 12 noon. He went to school at 10 a.m. He is at work/play/writing Novel. MR. Faraday waited at the corner of the room. He retired from headmastership at 60. He got married at 25. He looks at the Girl. He laughed at the man. Watch sells at 6 dollars. I bought English Grammar at 5 dollars. He drives at 60 k.m per hour. We wondered at the depth of his knowledge. He walks about the town. The idle man is standing about street corners. He has not any money about him. This book is about wild animals. I shall set out about 6 p.m. I know nothing about his business. I am glad about his success in Professor. He fields about Oxford are charming. He values honor above life. Your conduct has ever been above suspicion. They ran after the thief. The girl takes after her mother. He reached home after sunset. I will come back from the USA after a month. I shall never help him after what he has done. After all my efforts I did not come out successful. After all my warnings he took to gambling. The rowed against the current. He wrote against the proposal. They raised their voice against the proposal. The truck dashed against the bus. We should save money against the rainy day. Place the ladder against the tree. He set out for home. I shall catch the train for Howrah. He prepares for the Madhyamik Examination. She has no love for her Children. She has a weakness for silk cloths. He has a taste for Art. He has been here for a week. I have not seen him for many days. He will be cripple for life. Substitute a noun for a verb. Are you for the proposal? He spoke for the bill. I am anxious for his safety. Kashmir is famous for its scenery. I could not go to school for my illness. For all his wealth he is unhappy. We walked for five miles. The road is lined with tress for two miles. Useful Rules 'From' with Preposition Examples. He has gone from home. I go from Milton to Cambridge daily. I know here from Childhood. He will begin to coach me from 2nd July. She drew water from a well. He is descended from a royal family. This picture is painted from life. I took a dagger away from him. He has been suffering from dysentery. He dis this from spite. His opinion differs from mine. Fill the pen with ink. She took it with both hands. She went for a walk with her uncle. I shall be with you in a few minutes. I shall do it with pleasure. I left the bicycle with my friend. I parted with my friend yesterday. With all his wealth he is unhappy. He is not popular with his pupil's. I found him within the house. You must be back within an hour. He does not live within his income. It is twelve to eleven. He works from morning to evening. We won by two goals to nil. We will fight to the last man. Jimmy was the first to arrive ( who arrive first) there. To my utter surprise, he failed. He gave a mango to the beggar.